Today I had an unexpected hour of free time and I thought I would have a go at decoupage. This craft is suspiciously like expensive papier mache and nothing like the decoupage I remember where you basically have lots of copies of a picture, then you cut out smaller sections and layer them with little sticky pads in between to make a 3D picture. 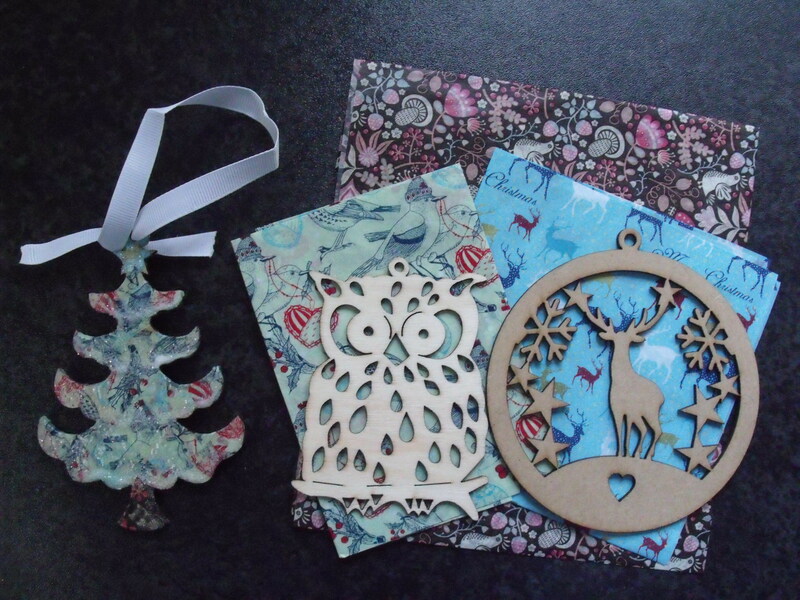 This month I have picked up two craft magazines which both had a Decoupage kit on the front. The first magazine was Homemaker Magazine, this had a lovely double decoupage kit with two wooden cutouts, one was a tree, the other a stag. The second magazine was Crafts Beautiful, this has a lovely set of felt woodland creatures and a decoupage owl as a free kit. As a bonus, I bought my copy in Tesco which had a free book with it as well! For my first attempt I chose the tree shape from Homemaker as it was the least fiddly. I found some old PVA glue and I combined the papers from both kits to go for a traditional brown trunk, green leaves and a golden star. The Homemaker kit had a wide brush included so I was good to go. Clean an area of table and place down a large, wipe-able mat. Decide which papers you are going to use, cut them into small squares and triangles if, like me, you are going for a papier mache look. If you wish to have a whole sheet image, you will need to use a slightly different approach to that described below, and make sure you have a long craft knife to cut each hole. Think about which areas will need to overlap if you wish to use more than one paper, for example in the tree, I wanted to have a tree trunk, and ensure that the green boughs would be over the brown paper. The first layer in this case is the brown paper. Paste a layer of PVA across the whole of the first side of the shape, placing it on the mat you prepared earlier. Then add a second layer beneath each piece of decoupage paper that you are going to lay down. Using the same brush, paste more PVA carefully on top of each piece of paper, using the brush to press down and smooth out any wrinkles. Gently press any pieces which overlap the edge around to the other side. You may need to use a craft knife to make a small cut to help you paste around a tricky edge and you can use a small rounded tool, for example the end of a pen or a knitting needle to push through and smooth around small holes, for example eyes. 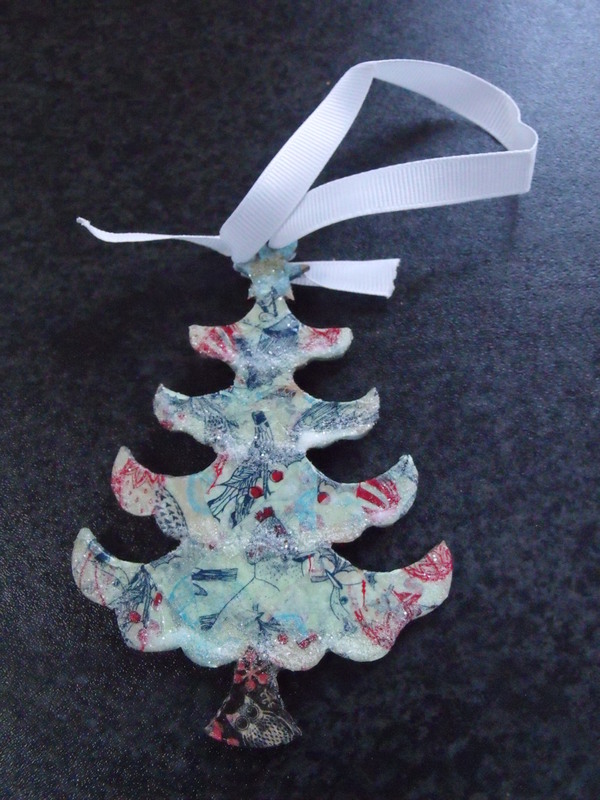 Keep applying pieces of decoupage paper until the shape is completely covered, paste over one more thin layer of PVA over the shape and leave to dry. When it has dried clear you can add a second layer of papers if you wish, or fill in any gaps that you have missed. If you wish to paper the other side of the shape you will need to repeat the process above. When you are happy with your decoupage you can add finishing touches. This kit came with a bag of glitter. To apply this, paste PVA on the areas you would like to add glitter to. Place the shape on a piece of paper and shake the glitter over the whole shape. Tip the shape onto it’s side and bang gently to remove excess glitter. You can repeat the process by placing the shape on a second piece of paper and pouring the excess glitter back over the shape. Leave to dry until PVA is clear. When completely dried stand back and admire your work. This kit came with a piece of ribbon to thread through the top of the shape, this was just threaded through the hole at the top and tied off. I am happy with the end result but I should have prepared my materials first. The PVA I used was too thick and the paper wrinkled very easily. I cut squares of paper as I went along which lead to the glue drying slightly between layers. I also think cutting triangles may have made it easier to press around the edges and into corners, I found myself pressing around the edges with my fingers as it dried. The glitter was a nice touch, though very pale, I may try using other embellishments on my next project. It was a nice way to spend the afternoon and I’ll definitely try it again.